Is today seriously the 16th already? Apprently it is. That means that it's time to reveal the Bread Baking Babes bread and kitchen of the month! Babe Karen of Bake My Day has chosen a bread that is fairly hands-off. 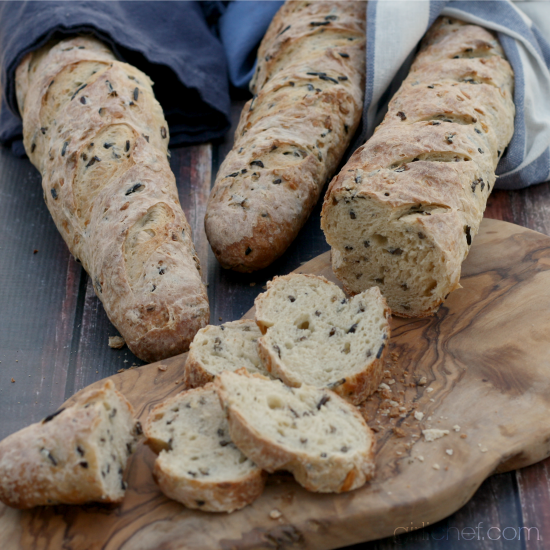 It can be mixed and kneaded and then stored in the fridge overnight (or over a couple of nights), and then be formed, let to rise, and baked when you're ready: Wild Rice and Onion Bread. Initially I planned to turn the dough into rolls and add them to my Easter bread basket. But that meal came and went in the blink of an eye. And I forgot. So, on to Plan B (which had not yet been thought out). I toyed with making a boule or a sandwich loaf until I remembered my lonely baguette pan. I think it's been in the same spot for so long that I don't really see it anymore. Do you know what I mean? My eyes just sort of graze over it like it's part of the woodwork. Somehow I managed to actually see it, and then I knew my decision was clear. I needed baguettes. I'm actually really happy that I decided to go in this direction. The dough made 3 lovely sized loaves, though they were slightly larger than a "true" baguette. But there were no Baguette Police around, so I got away with it. And really, it's only one in name and appearance, as the texture and crumb were not what comes to mind when you think baguette. I used dried chopped onion, which was very VERY intense, in both flavor and aroma. 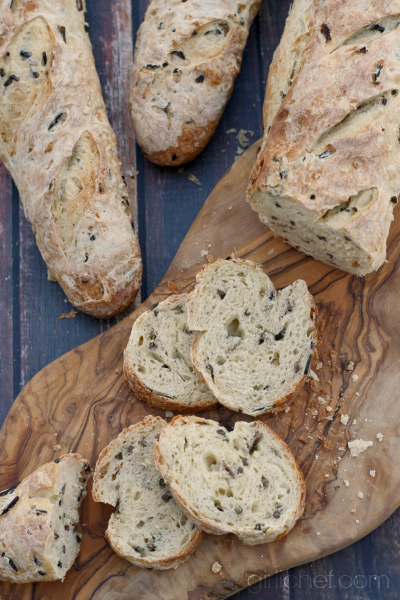 This bread is definitely not made for the onion naysayers. Some of the other Babes used caramelized onions instead. You could also use raw onions. The wild rice could also be substituted for another grain, but since I had a package begging to be used, it worked out perfectly. I kept a baguette, gave one to our neighbors, and sent one to work with the husband. We ate ours in two sittings. Once with spaghetti, and once (crisped) with scrambled eggs. Our neighbors said that they heated up some Marinara and tore through half a baguette immediately. At work, it was passed around and devoured with morning "family meal". I deem them a success - thanks Karen! 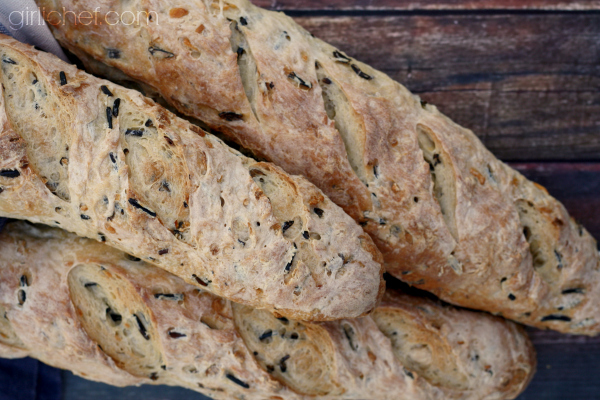 Intensely flavored baguettes studded with onion and wild rice. Combine all of the dough ingredients in a large bowl (start with the lesser amount of flour, adding more as needed). Using a wooden spoon or dough whisk, stir everything together until shaggy. Some of the flour may not be incorporated, that's okay. Turn out onto your work surface (excess flour and all, if there's some in the bowl) and let rest for 5 minutes. Knead until the dough is fairly soft and supple and slightly tacky. While kneading, if dough seems too dry, dribble in a bit of lukewarm water. If it seems too wet, adjust with a tiny bit of flour. This should take 5-10 minutes. Transfer to a lightly oiled bowl, cover with plastic wrap, and refrigerate overnight (or up to 4 days). At this point, my dough weighed: 51.5 ounces (1459 g). Remove the dough from the refrigerator and let sit on counter for 2 hours before you plan to bake. Turn dough out of bowl and divide into three. 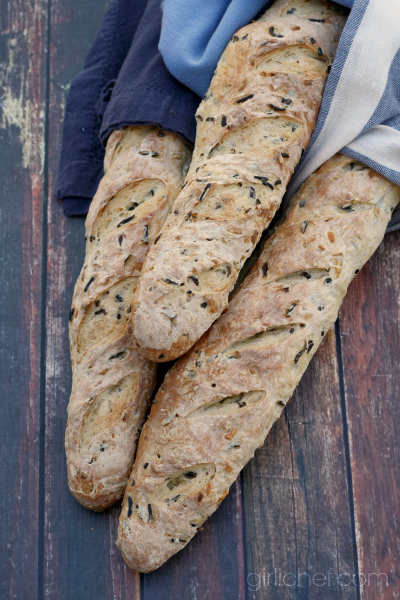 Form each piece into a long rope (see this tutorial on shaping a baguette or batard - go longer and thinner for a true baguette); mine are about 16" long. Place on an upside baking sheet or into the grooves of a baguette pan that has been set on a baking sheet (for easy handling). Spray one side of a sheet of plastic wrap with cooking spray, then set it lightly over the loaves, sprayed side facing the dough. Allow to rise at room temperature until it has increased by 1-1/2 times its original size, 90-120 minutes. Preheat oven to 350°F about 15 minutes before baking time. Brush a light coat of water across the tops of the baguettes (skip this part if you want a more golden crust - this gives it that "washed" look). Alternately, you could brush it with egg wash for a shiny crust. If you like, make a few slashes in the top of the dough. Slide into preheated oven and bake for ~25 minutes, or until rich and golden in color and when you lift it up and thump it on the bottom, it should sound hollow. If you have an instant read thermometer, its internal temperature should be above 185°F in the center. Transfer to a wire rack and allow to cool for at least one hour before slicing. boules - divide dough in half and form each piece into a "round". Set on baking sheet lined with parchment or a surface scattered with cornmeal. (Once oven is preheated, slide risen dough onto a preheated baking stone). Cover with oiled plastic and proceed with proofing/rising. Bake for 45-55 minutes, or until its internal temperature should be above 185°F in the center. sandwich loaves - Divide dough in half, then form into squat cylinders and place each one into lightly greased loaf pans measuring about 8" x 4". Cover with oiled plastic and proceed with proofing/rising. Bake for 45-55 minutes, or until its internal temperature should be above 185°F in the center. 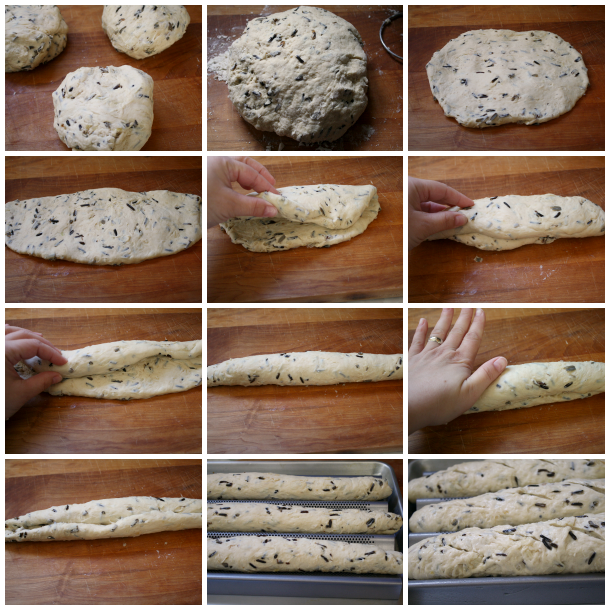 rolls - Divide the dough into 24 pieces (12 per half). Form each portion into a ball, then place into a lightly greased 9"x13" pan (12 per pan). Cover with oiled plastic then allow to rise until a little more than doubled in size. Slide into preheated oven and bake for 12-15 minutes, or until rich golden in color and cooked through, rotating pans halfway through. Cool for 20 minutes on a wire rack before serving. For a shiny crust, beat together a whole egg (or just an egg white) with a teaspoon of water, then brush over the top of the loaves or rolls instead of the water. So which Babe is the hosting kitchen this month? That would be Karen at Bake My Day, if you'd like to join in, simply make Wild Rice and Onion Bread (yes, you may adapt) - and then send Karen your link (info in her announcement post). Submissions are due by May 29th. Once you've posted, you'll receive a Buddy badge for baking along. I hope you'll join us this month!